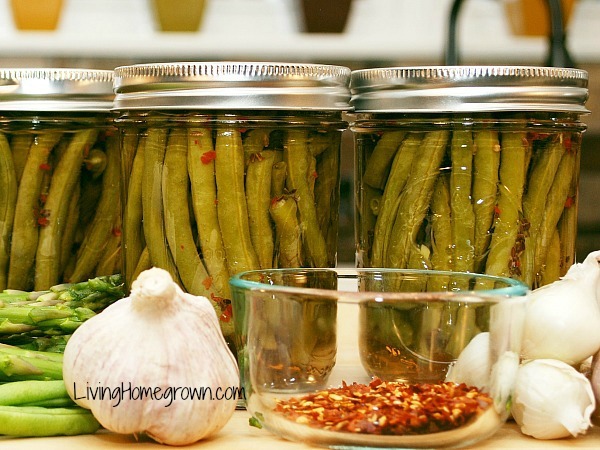 LH 48: Green Beans, Botulism and Jar Label Stick’em – Oh My! 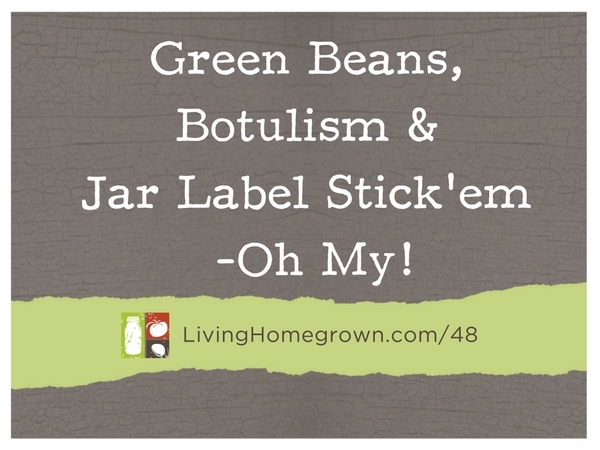 Green Beans, Botulism, & Jar Label Stick'em - OH MY! This week’s podcast and show notes summary are a little all over the place because I’m answering two separate listener questions – Both canning related. One was about canning green beans safely (and botulism) and the other was about kitchen hacks for removing stubborn canning jar labels. Q1: Is it safe to water bath green beans? This is a very common question that I get every year. A lot of people want to do this because they hear it is okay to do. But the short answer is…no. You should NOT water bath green beans. They can only be water bathed IF they are pickled. However, it is important to understand WHY you can’t. Or you may even have a friend who swears this is a safe practice because they have tried it and no one died. Or you may have had a Grandmother who did this and it seemed okay way back then. Well, that is just dandy that some people have done it without getting sick. But if done today, you are may not be so lucky. Now, I could explain all the science-y and horticulture reasons that some people have gotten away with it in the past (I have been known to use my engineering degree with my hort background to totally geek out on the science/physics behind canning). But I’m not going to do that here because when I do, I find people try to use that info to “game the system” and cut corners so THEY can water bath can green beans. And that would be foolish. Don’t try to cut corners in canning. When dealing with foods like green beans, you should not try to cut corners. You see, there is a real risk in water bathing straight green beans. And the risk is botulism – a serious food born illness that can be deadly. So, don’t water bath green beans UNLESS you are pickling them with a vinegar brine. There is a bacterium (clostridium botulinum) that is commonly found all over the place – including garden soil. A spore from this bacterium will grow and thrive when it sealed up inside an airtight container that also happens to be a low acid environment. Well, a canning jar is an air tight container and green beans are a low acid food. So in other words, those beans sitting in a jar of water are creating the exact environment where botulism spores loves to throw a party. And when even a single spore throws a party, it creates the botulism toxin that can make people ill or even die. And where’s the fun in that?! So…you can only water bath can green beans if you pickle them in a vinegar brine. That vinegar will create a super high acid environment that keeps the spore from doing anything dangerous. The bottom line is that although there are some safe areas to play and experiment when canning, there are other areas where you really, truly need to play by the rules. Green bean canning is one area where you should just play by the rules. Theresa, all of my canning jars are making their way back home to me from family and friends, ready to be filled up again this canning season. But they are coming back with the labels stubbornly stuck on, having been sent through the dishwasher plastering the labels to the jars. Yes, Amy – I DO have a little trick up my sleeve when it comes to stubborn label residue! First, I always try just soaking the jars in warm soapy water, as you did. (I use Dawn Dishwashing Liquid) And many times this is all it takes. But as you stated, there are many times that water does NOT work on some label’s glue. This method is AWESOME! No joke. The coconut oil lifts up the adhesive and the baking soda gives you grit to when you rub. It works best on a dry label. So if you have already soaked in water, let the label dry before trying this. Mix equal parts coconut oil and baking soda into a paste. A spoonful of each is enough. Cover the label area with the paste and let is sit for 15 minutes. Use a sponge, paper towel or a green scrubbie sponge to wipe away the residue. It usually wipes right off 9 out of 10 times. If the label was really thick, you may need to do a second application to get the lower layer off. Just slap it on, wait another 10-15 min and wipe away. You should not have to scrub it other than a gentle rub. The paste does all the work. I decided to do an experiment to see if there’s something special about the coconut oil vs. other oils. I’ve always used coconut oil. But since not everyone has that in their cupboard, I thought I would try other oils. I was unsure if they would have the same results. So, if you don’t have any coconut oil, give one of those a try! Good luck! Next week, I’m opening the doors to my Canning Academy for the Spring session – This is canning training at your own pace but with lifetime access. CLICK HERE to be notified when that happens. I’ll send you the links with all the details next week, so you can check it out. Canning Academy – the doors are opening at the end of this month for the Spring session! Since this is Q&A session, I have a question about jars. For couple of years a Chilean home store was selling Ball-type canning jars but since 2-years ago I can’t find them anywhere . Here everybody here cans with commercial-type canning jars (the ones you can find when you buy jelly at the grocery store). It is safe to home-canning with this jars? Do the rules apply the same? Thanks a lot! There are a lot of variables to the different jar lids out there and I’m not sure which ones you have in Chile. Your question really needs a longer answer so I think I will have to cover this in an upcoming blog post. The short answer is that the lids I think you are referring to are not USDA approved for home canning, so there is not a lot of info available to home canners here. However, that does NOT mean they are dangerous. It just means that all the different brands available have not been tested and standards or guidelines created for them in the United States. Each brand and style can have different tweaks to make them work. And so I can’t say universally the same rules apply. Just discovered your podcasts and have been catching up! Question about canning tomoatoes – I heat in the oven to save space on my stovetop. When the tomatoes start to release the juice, I suction it out with a turkey baster so the resulting tomatoes get thicker faster (instead of cooking to evaporate). We actually love to drink this tomato “water”. My question is – ok to can it just like tomatoes, with lemon juice added and same amount of time processing in water bath? thanks! I think there is a typo in your question so I am not exactly sure what you are asking. Are you wanting to know if you can put up the tomatoes with no liquid at all? Or are you asking about putting up the tomatoes in a thickened (paste-like) state? sorry for lack of clarity – I am asking about canning the tomato water that I have suctioned out of the tomatoes. I would can it just like tomatoes. I then also do can the tomatoes that are now thicker because I have removed the tomato water. I have to say that this was really great information! I had no idea that I could not water bath green beans. I’d like to try my hand at pickling first anyway. I think you are correct about the oil. And for the record, I have seen peanut butter used to get the labels off canning jars too. But I have not tested it to see if it works better or not. Good call though! As far as labels, after years of struggling with this one, I finally broke down and bought a label maker. Best purchase in years. The labels stay on well, but come of with no sticky stuff, even after being sent through the dishwasher. And no, I don’t work for the label makers, just a happy homesteader. Good to know Stacy. What brand of label maker did you buy? It’s the ubiquitous brother p-touch. The labels can be pricey is you buy them at a local store, but amazon has a good price, both on the name brand and an off-brand. Enjoyed the podcast. Regarding sticky labels – soaking bottles and jars for a few minutes in a bucket or sinkful of water with a scoop of Oxiclean makes most labels slide right off. Awesome Susan – I will try that.